KIDAPAWAN CITY -- Horse shows and competitions have been gaining a lot of support in Mindanao as proven by the recent 1st Timpupo Lumba sa Kabayo here. Amazed by the support of the public, Kidapawan City Mayor Joseph Evangelista declared that “there will definitely a second Timpupo Lumba sa Kabayo,” which was part of the 10-day celebration of the Timpupo Festival here. Timpupo Festival is a celebration of abundant harvest during the Foundation Anniversary of the city. This year is the city’s 75th. Jemar Remon, president of the DavSur Horsemen, with 38 members coming from the provinces of Davao del Sur and Cotabato, and, the lead organizer of the Timpupo Horse Event, was surprised and overwhelmed with the support of horsemen from all over Mindanao and the Kidapawan City crowd he estimated to be around 10,000. Records of the secretariat of the event bared 65 horses that participated in the race that featured three main events - barrel, oval and obstacle races for eight classifications including kiddies, youth, ladies, novice, intermediate, executive, royal and expert. Olaguer, in an interview, said he was “all the more inspired to promote horse shows and competitions” after seeing the huge crowd gathered at the five- hectare race track at the 3P Farm in New Bohol here. This year, the lawyer-horseman bared that two more horse clubs were added to the rooster of members of the PHF - the DavSur Horsemen and the Davao Oriental group. The latter's membership to the Federation is being processed. The DavSur Horsemen was declared official member of Olaguer’s organization during the Horse Show and Competition in Malita, Davao Occidental early this year. Ben Aznar, a competitor in the expert division representing the Davao City Horse Club (DCHC), underscored that horse shows and competitions is the only sport event that all members of the family can participate in. “Grandparents to grandchildren in a family can compete in different events and categories,” Aznar said. Aznar’s wife, Delia, is the vice president of the women-led Davao Horse Club whose president is Melody Gopnzales. Aznar’s son, Ryan, has also been racing in the executive division, while their grandchild, six-year-old Tanya, had been bringing home medals for her participation in the kiddies division in almost all horse races in Mindanao. Along with the growing membership in horsemen clubs in Mindanao, the enthusiasts, said Kobi Troy Tan, are also continuously breeding and upgrading the breeds of their horses. 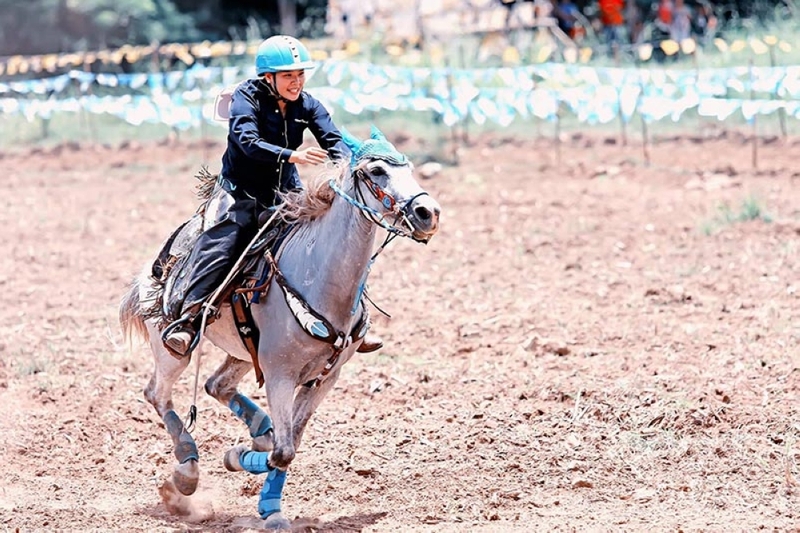 “In the next three to five years, horse events in Mindanao will level up because by then the riding skills of horsemen will also improve a lot,” Tan added. Tan’s father Andy, mother Cielo, wife Monica and his three-year-old son have been joining all horse shows and competitions in Mindanao. Kobi bagged two awards, third place in obstacle race and second place for the barrel race in the Expert Division while Monica, after a year of hiatus, stage huge comeback by bringing home the trophy for the second place in the barrel race for the Ladies Division as their son Chase placed third in the barrel race for the Kiddies Division. “With great victory comes great sacrifices,” he posted on social media post showing his son Chase receiving his award. Sarda, who was second in the barrel race and also second in obstacle race in the Royal Division during the Timpupo Lumba sa Kabayo las August 11 to 12, is another grandparent who succeeded in herding his three sons to the race track. A family of cops; two of his sons also showed their wares. One of them, Marlowe, who is also a barangay official here, brought home the trophy for the second prize in the Novice Division of the barrel race. Since October last year, a total of seven horse events sanctioned by the PHF were held in different parts of Mindanao including those conducted in Davao City, Isulan in Sultan Kudarat, Barangay Mana in Malita, Davao occidental, Malaybalay in Bukidnon, Patin-ay in Agusan del Sur, Mati in Davao Oriental and the Timpupo Lumba sa Kabayo here.